Jewelmint and all of the “Mint” family sites are running a 50% off sale items deal right now. Also, if you buy two items you get free shipping. On sale + 50% off + free shipping (assuming you order at least two things) so it’s an amazing deal. They’re probably hoping you can’t resist picking up something for full price as well. I think all of the “Mint” companies are a little on the high side since I can get similar quality costume jewelry at a locally owned store near me for about $15 apiece full price. But I stay subscribed, click “skip month” each month when I get the notice and watch for specials and have been able to pick up some really nice pieces when they’ve either gone on sale or they run a promo. I’ve been somewhat interested in buying something from ShoeMint and StyleMint but kept putting it off. JewelMint’s Trove Hoop earrings are normally a $29.99 down to $10 on sale. They look like a good wardrobe staple and I don’t often see good two tone jewelry. Customer live chat said they aren’t a heavy earring so here’s to hoping that that’s correct. 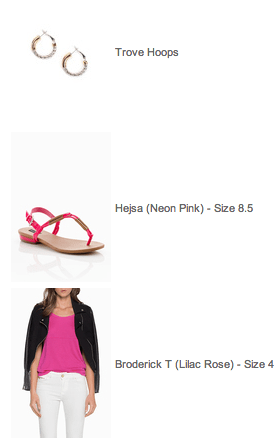 I’ve had my eye on the ShoeMint Hejsa neon pink sandal for awhile but again didn’t think they were worth the $80. At $31.99 PLUS 50% off they are just $15.99 – yeah no brainer. Neon and neutral!! Yay! There were no sale items from IntiMint available in my size so I just skipped that one. All in total I spent $37.48 including free shipping for a pair of shoes, shirt and earrings. I’ll be doing reviews when I get them in here. I was having a hard time coming up with reviews of the StyleMint shirts in particular so hopefully I can help people out on that front by sharing some video on that when I get it in. Have you bought anything you loved from the Mint stores lately? Well I did in fact say in my previous post that I have bought the silver Michael Antonio “Jaxine-MET” for $19.99 from 6pm.com. Starting at the point where I wasn’t even standing up in them and they were already really uncomfortable. And yes, I did also stand up in them. Same problem. They just really don’t fit my foot shape whatsoever. The strap at the toes pinch and just don’t seem to be a position that works well. It looks like maybe if you have longer toes this might not be the case. You can see in the pictures below just home much extra shoe there is beyond my toes. You don’t want toes hanging off the edge but this seems a little too much and my foot is following the other curves of the shoe. The heel of the shoe IS silver (from the photos on 6pm.com I thought there was a chance that the heel was white.) Just thought I should also mention that since it was something I was wondering about when I made my purchase. And a reminder, if you buy from 6pm.com the shipping to you might be free (and great if you’re sure about the shoe) but you have to pay the return shipping (not great if the shoe doesn’t work out.) Debating at this moment if I spend the money and ship them back or take them to the consignment store and hope someone buys them. Probably pay the shipping and send them back… blah.